Everyone needs to experience the Grand Canyon through the ears of a sure footed mule. From the North Rim of the Grand Canyon we offer a one hour and a couple three hour trips. The three hour mule ride to Supai Tunnel will descend into the canyon 2300 hundred feet, following the North Kaibab trail into the natural wonder, the Supai Tunnel. 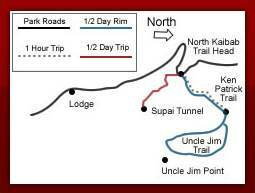 The three hour Trip to Uncle Jim’s Point follows the Ken Patrick Trail. The one hour Rim of the Grand Canyon mule ride offers a relaxing ride through the Kaibab Forest and along the majestic Canyon Rim. For a day of fun & excitement come out and ride a mule. All rides are with experienced guides and our mules are selected for their gentle temperament, being trail wise and sure footed. Shuttle bus to trail head leaves the lodge one half hour before trip departure times. Grand Canyon Trail Rides is an Authorized Concessioner of the National Park Service.